From this time on, Blackbeard’s little squadron began to haunt the sea lanes between the mainland and West Indian Islands. Several times they put into Cuba and sold their booty in Havana. Although these buccaneers roamed far out to sea, North Carolina became their headquarters. They used a number of hideouts, for it was too dangerous to always return to the same spot. Legend says that one of their retreats was up the Chowan River as far as Holiday’s Island. Probably the favorite refuge, however, was Ocracoke Inlet. Tradition indicates that a house known as “Blackbeard’s Castle” used to stand in the village, and an inlet not too far from today’s village of Ocracoke was known as “Teach’s Hole” (known today as Springer’s Point.) Here, supposedly, Blackbeard came to careen his ships. One of the best hunting grounds in the Atlantic at this time was off the port of Charleston, South Carolina. This Port was the busiest and most important in the southern colonies. Because of the happy prospect of taking richly-laden merchant vessels, Blackbeard’s flotilla began to hover outside the entrance to the harbor, ready to pounce upon the first unwary victim that shoved its bowsprit into the open sea. One ship was taken, then another, and still another. They carried rich cargos. One ship was carrying 14 slaves, while another held over £6,000 in gold. Before the South Carolinians realized what was happening outside the harbor, eight or nine ships had been quickly taken. Within Charleston, all was confusion. Trade came to a standstill. Eight ships lay tied to the wharves, not daring to hoist their sails. Blackbeard chose this moment to display not only his colossal nerve but his contempt for all landlubbers in general. His medicine chest was low. Charleston was near, and the apothecary shops of that city held drugs he needed. And he held all the trump cards. Among the prisoners taken from the captured vessels was Samuel Wragg, a member of Governor Johnson’s Council. Such an important person made an excellent hostage. Lieutenant Richards of the Revenge was selected to make a demand upon the town for the medicines necessary to fill the pirate chest. In a small boat, Richards arrogantly steered into the harbor. Another man named Marks, also a captured passenger, was sent along to verify the capture of the ships and the holding of the hostages. To Governor Johnson, Richards delivered an insolent message from Blackbeard. Unless declared the pirate captain, the town made up the necessary list of medicines, the hostages would be killed and their heads delivered to the governor. Not only this, warned the report, but if the pirate’s demands were not fulfilled, Blackbeard threatened “to burn the ships that lay before the town and beat it about our ears.” Two days were allowed to fill the medicine chest. The governor called his Council into emergency session. While the demands were being debated, Richards and his companions strutted boldly about the streets of Charleston. The governor and the Council had no wish to give in to the pirates, but there was nothing else they could do. 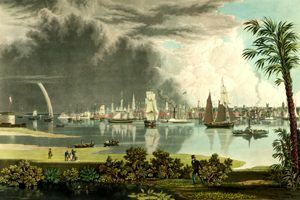 There was no warship in the harbor to protect Charleston, and the pirates could have sailed in and sacked the town with practically no opposition. Sadly, and perhaps also a little embarrassed, they filled Blackbeard’s medicine chest with supplies costing between £300 and £400. Still holding Marks as hostage, Richards and his pirates started back for their ships. A sudden squall upset their boat and forced them back to shore. When they finally were able to beat their way back, the two-day deadline had expired, but Blackbeard had not yet carried out his threat to kill the hostages. The captain kept his word and released the prisoners, but not until they had been plucked clean. All their money was taken, including Samuel Wragg’s £6,000. The better-dressed of the prisoners were stripped of their finery and sent, half-naked, back to shore. Blackbeard’s infamous crew then set their sails and gaily made for North Carolina. Behind them, they left an angry and mortified Charleston. The people of Charleston neither forgave nor forgot, as Stede Bonnet and his crew, much to their sorrow, were to discover. Incidents such as these furnished the excitement on which Blackbeard thrived. There were days when life was dull, and the pirate captain had to find his own thrills, thrills which were usually tinged with cruelty and touched by terror. Perhaps such a display was necessary to maintain discipline and keep down the frequent plots to remove him from his position of authority. Always he tried to demonstrate to his men that he was superior to them in every way. Upon one occasion they were becalmed on a flat and glassy sea. Not a whisper of a breeze wrinkled the limp sails hanging from the yardarms. The men were irritable and spoiling for a fight. For the lack of some better amusement, the pirates broke open the rum barrels. Suddenly Blackbeard, “a little flushed with drink,” leaped to his feet and shouted to his men, “Come, let us make a Hell of our own, and try how long we can bear it.” Three of the more daring members of the crew accepted the challenge and followed him down into the hold of the vessel. They seated themselves on the rocks used to ballast the ship. The captain shouted directions for several pots of brimstone (sulphur) to be brought down and lighted. The hatches were closed tight. The dark hold was soon filled with swirling clouds of the choking fumes. The gasping sailors cried for fresh air. Only then were the hatches thrown open, the captain “not a little pleased that he had held out the longest.” It is said that one of the sailors jokingly said, “Why Captain, you look as if you were coming straight from the gallows.” “My lad,” roared Teach, “that’s a brilliant idea. The next time we shall play at gallows and see who can swing longest on the string without being throttled.” There is no record of anyone expressing a desire to play this game with their leader. Such was the nature of the man who had humiliated the citizens of Charleston. This was the man who seemed to be continually searching for excitement. But now a strange mood seems to have descended over the once savage beast. Now he appeared to crave the quiet life ashore. Even so, his admirable intentions were shot through with greed and treachery. Upon their return from Charleston, the pirate fleet had sailed into Topsail Inlet. There, on the pretense of careening his ships to scrape the hulls, Teach ran two of the vessels aground. And suddenly, with a great show of generosity, he placed Major Stede Bonnet in command of the Revenge once again. Then he confided to Bonnet his own future plans. He had learned, said Blackbeard, that the king had extended his offer of pardon to all pirates who would voluntarily come in and take the oath. He declared that he planned to do this and urged the major to do the same. Bonnet left for Bath almost immediately. Almost before he was out of sight, Blackbeard loaded all of the booty on the ship Adventure and together with 40 members of the crew, slipped out to sea. Some of the sailors who were left behind made their way overland to Philadelphia and New York. Others, fearing the wrath of their captain, hid on shore. Seventeen others, who objected to Blackbeard’s methods, were marooned on a lonely sandbank without food and water some 13 miles from the mainland. This group was later rescued by Bonnet. Scattering the crew meant a larger share of the spoils for the selected 40 men who remained with their captain.